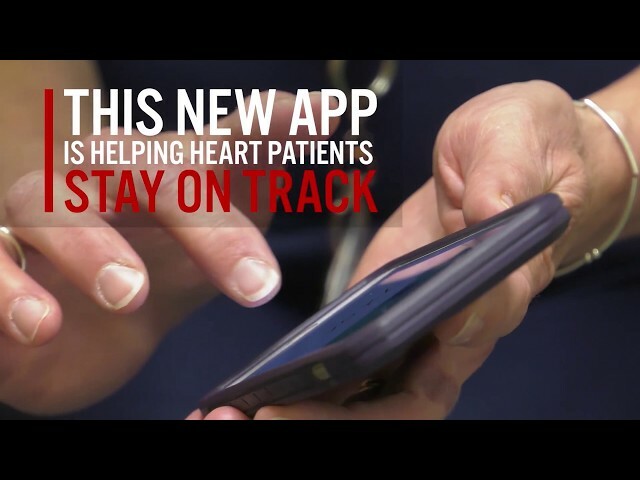 An Ohio State nurse just developed an innovative app to help heart patients. It's not every medical center that can take one nurse's idea and create the necessary tools to transform her concept into new software that helps patients. She had an idea she believed could help heart patients. We listened. We thought she was on to something big. We were right. It could truly improve patients' lives. Right now, at The Ohio State University Wexner Medical Center, a unique collaboration between a cardiovascular nurse and a team of digital developers is helping heart patients take control of their health. Rose Chumita, a registered nurse at Ohio State's Richard M. Ross Heart Hospital, knew that her patients were desperate to improve their heart function, but they didn't have the right resources to keep them accountable and monitor progress. "After surviving a heart attack, many patients go through cardiac rehabilitation for three months," Chumita says. "When they leave rehab, it can feel like they've lost the connection to their care team. Some patients travel long distances to see us at the Ross Heart Hospital, sometimes with six months between appointments – that's a long time to wait to check on their progress." Chumita decided to fill that time gap with an app. Her design could monitor health habits through interactive messaging and other personalized technology. Patients using the app are better equipped to lower blood pressure, weight and cholesterol. Plus, treatments often end up costing less. Chumita's development team anticipates that the app also will lead to reduced hospital readmission rates among these patients. Chumita was awarded the annual Elizabeth M. Ross Nursing Fellowship to facilitate the app's creation. The fellowship is part of a $1 million endowment made possible by a generous donation to support new efforts of Ross Heart Hospital nurses. A software engineering team in the Ohio State University's Department of Biomedical Informatics joined Chumita to bring her idea to life. Led by Puneet Mathur, the research and development group combined its technological know-how with Chumita's insight into patient behavior to create the MyHealthTrack mobile app. The app is uncomplicated, presenting users with minimal buttons to input blood pressure readings and weight, as well as fluid and sodium intake throughout the day. A grant from The Ohio State University College of Nursing's Innovation Studio enabled the purchase of wearable activity trackers for the pilot program. This allows patients to connect the wristbands with the app to track their daily steps alongside other health metrics. "The design is made for a patient population on the older side of the age spectrum," Mathur says. "They don't want to have to look around for many buttons." MyHealthTrack warns users when their numbers fluctuate too high or too low, and it gives immediate feedback and suggestions. Patients can easily make cause-and-effect connections between their blood pressure and diet that day, for example. "This app gives patients something self-motivating and tangible that isn't dependent on the physician," Chumita says. "It's a way for them to contribute to their own better health." While patients log data into the app, Chumita and other healthcare providers back at the hospital are able to view their patients' numbers and offer more individualized suggestions to each person. An "insights" view within the app shows users their numbers over time. It gives both patients and their local primary care providers a wider, clearer picture of their day-to-day health than the numbers gathered at just one visit to the doctor. MyHealthTrack currently is available to a limited group of Ross Heart Hospital users, but soon the app will be more widely available. The team's long-term goal is to make the app downloadable to anyone, both in the Apple App Store and in the Google Play Store. Mathur hopes to make the app's framework available to wider patient populations with other chronic conditions such as diabetes. "This type of collaboration is one other institutions can struggle with. Their clinicians may have great ideas, but they don't know how to implement them," Mathur says. "The Ohio State University Wexner Medical Center is self-sustaining, with the resources to generate these ideas, bring them to life and stay one step ahead." Chumita is just one of more than 5,000 Wexner Medical Center nurses dedicated to improving the lives of patients through compassionate, high-quality, innovative care.